In 2016, the BSA Boy Scouts of America updated and revamped their Boy Scout Program. 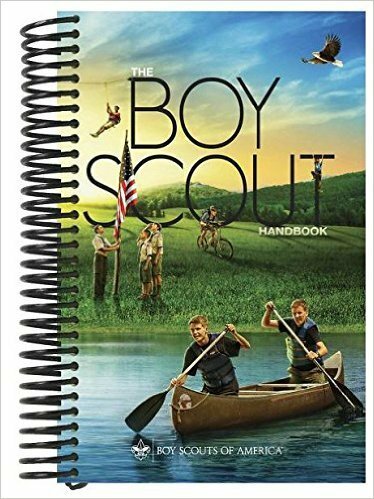 This 2016 13th edition of the Boy Scout Handbook includes all of the recent changes and can take your son from Scout to Eagle and beyond. Includes checklists for each rank, nights of camping, service hours and more. This book can be purchased at your local scout shop or found online. The troop recommends each Scout spend 10 minutes per day reading the handbook to prepare them for rank advancement. Your scout is strongly encouraged to bring his handbook to each troop meeting. We would also recommend you purchase a cover for this book to help protect it at campouts and other outdoor events. Boy Scout Field Book is a good source of additional information and in-depth information on material covered in the Boy Scout Handbook.